After last summer's trip to Peru the Mazamas asked me to write an article for their annual publication. Since that is only distributed to members and its free I thought I might reproduce that article here. But beware, it is a long story. Established routes on Pukaraju as of July 2009. Climbing loose blocks, trying to reach snow in Caraz II's central couloir. Caraz II's central couloir: obvious, attractive and unclimbed. After sitting for 2 hours in the icy wind coming off Laguna Querococha, a dilapidated Volkswagen bug pulls off the empty dirt road. I wonder what they’re thinking as we try to fit our two loaded backpacks and our combined 370 lbs of unwashed bodies into the back seat of a vehicle already laden with two passengers and their luggage. A 4-week climbing trip to Peru’s Cordillera Blanca sounds like a long outing. However, if there is just one thing that my three expeditions have taught me about Peru and expedition climbing, it is to expect the unexpected. These hard-learned lessons were confirmed as Marcus and I endured two national transportation strikes, high-altitude pulmonary edema and the ubiquitous gastrointestinal illnesses one must endure while traveling in the developing[-]world. With the help of the Mazamas and the American Alpine Club, Marcus and I were able to spend July 2009 attempting two new routes in the Cordillera Blanca. Despite the difficulties we encountered, we were lucky enough to establish one first ascent, on Pukaraju. We began by drafting our grant proposal for the unclimbed and unattempted central couloir on the east face of Caraz II. Three couloirs split the east face of this peak. The right and left couloirs had been climbed in 1986 and 1997 respectively. This face had received relatively little attention, especially compared to its more famous neighbors, Artesonraju and Chacraraju. In 2004, renewed interest and favorable conditions resulted in the establishment of two new routes on the east face. A French team established a direct finish to the left couloir, Salida Directa de Los Gordes (ED1 2300 ft., 90-95 degrees, 6a, A2). An Australian team climbed a new route, the Australian Route (ED1 2300 ft., W3, V+, A2), which ascended the right couloir but finished on mixed ground in the center of the face. Speculation had it that the central couloir would yield thin ice and mixed climbing. Apparently the most difficult portion of the route would be finding a direct line through the final granite headwall. This year a very snowy Andean summer and fall (anecdotally the snowiest in the past 30-years) presented climbers with unusual conditions. Glaciers that usually offered easy, yet circuitous, travel across neve held deep unconsolidated snow. South-facing walls known for excellent ice climbing by mid- to late July remained snow-laden late into the season. This year Caraz II’s thin ice and steep summit headwall would be the least of its problems. After arriving in Lima in early July, we barely beat a national transportation strike, reaching the Andes mere hours before all travel halted. Most climbs in the Cordillera Blanca and the nearby Cordillera Huayhuash range are based out of the city of Huaraz. This town has been described as South America’s Chamonix. Much of the range, including the Himalayan-like Huascaran massif, is clearly visible from town. Huaraz, at around 10,000 ft, is one of the lowest cities in the area. Though the transportation strike meant we would not be able to leave the city for the mountains as soon as planned, we were at least beginning to acclimatize. Our plan was to take a couple weeks of supplies into the Paron valley. Once there, we would explore the initial section of the central couloir and use nearby peaks for acclimatization. With acclimatization complete we would be ready to attempt Caraz II and know something about its nature beforehand. The narrow Paron valley is surrounded by 20,000 ft peaks on three sides. These stunning peaks are reflected upon the still, teal water of Laguna Paron. It is a relatively remote valley; no one lives in the valley itself and very few tourists visit the area. Climbers can be found in the area most days but their attentions are almost always focused on the southwest face of Artesonraju. The other mountains around the valley go years between ascents. I walked through the Paron valley in 2003 when I climbed the south arête of Artesonraju. At the time, I didn’t notice Caraz II. I learned about the face after reading reports from 2004’s first ascents. I was surprised to learn that the obvious central couloir had not been climbed. After more digging I discovered that this feature had been considered for a try by more than one alpinist, but had not yet been attempted. Those alpinists speculated that it would be relatively straightforward but would involve several thousand ft of thin ice and mixed climbing. On the same day the transportation strike lifted, we were in a taxi negotiating the dirt road that climbed into the Paron valley. We set up base camp in a small forest above Laguna Paron. Over the next several days we hiked progressively higher and established an advanced base camp a few hundred ft below the glacier. Though we had less than 2,000 ft from our advanced camp to the base of the route, the year’s significant snow proved a serious obstacle. We believed that we would be able to reach the base of the route with one day’s effort. On our first foray onto the glacier we worked for an entire day with hip-deep snow, gaining only half of the needed elevation. These efforts were mostly wasted by a storm that forced us into the tent and deposited new snow over our hard-earned boot-pack. After the storm we had another full day of effort on the glacier. We gained more elevation, but were unable to reach the route’s base. We hadn’t carried enough food to our advanced camp for the extra half-week that this difficult glacier travel and weather forced. I descended back to our food cache at base camp. The descent was well-timed as I encountered a group of Canadians who were eager to lighten their packs for the walk out. Their cheese, butter, tuna and mayo certainly helped round out the dry pasta from our cache. With our food stores re-supplied, we were positive that the route could be reached in a single day. We planned to cross the glacier, explore the route’s initial pitches and begin our ascent the following morning. At mid-day we had finally reached the couloir. Contrary to typical conditions, there was no ice or snow on the initial portion of the central couloir; it could only be reached via several pitches of loose steep granite. We spotted two possible routes. The first was up a difficult snow and mixed feature that may have brought us back left and into the couloir. We attempted this route but quickly realized it would require too much traversing on unknown terrain. Next we explored a shallow corner leading toward a right-trending ramp. An hour later I had knocked a half-ton of rock loose while only climbing 30 ft from the belay. In these conditions we needed a rotary drill to reach the couloir’s ice. Worse than that, Marcus had developed activity intolerance, productive cough, and periodic breathing; in other words, he had high altitude pulmonary edema. Two days later we had shuttled 300 lbs of gear over 10 miles and 6,000 ft of elevation. We had developed altitude sickness, had yet to see any real climbing, and realized that a year’s worth of preparation had been squandered. Back in Huaraz we tried to regroup. The Cordillera Blanca was still shrouded in a thick layer of snow. More routes than usual were not being climbed. We decided to attempt a route on Nevada Churup that is normally dry and thus out of condition. This year’s poor weather had laid down enough snow to make this route climbable. The alarm clock went off, but Montezuma was getting his revenge. The illness narrowed our already quite-limited time. The unseasonable weather had prevented us from attempting icy south-facing routes we had initially desired. We understood that this was a strange season and we would need to try a different kind of route if we wanted to have any success. Fortuitously, a friend mentioned that there was an obscure peak named Pukaraju which was rumored to have some ice lines. We visited the Casa de Guias (the Peruvian climbing guide’s headquarters) and scoured the Libro Rojo (a guidebook containing the descriptions of all new routes). We found several vague pencil-drawn maps indicating the half-dozen or so routes which had been climbed on Pukaraju. A friend who had been in the vicinity doing the research for a university study was able to fill in some blanks. His recent photograph encouraged us to spend our remaining time attempting this inconspicuous peak. Though easily visible from the road, Pukaraju is an obscure peak. With so little information available about the climbs in the area, we weren’t even entirely sure how to get there. Our friends had told us that it should be easy to reach Pukaraju from Laguna Querococha. The lake is a popular site for tourists heading to the ruins at nearby Chavin. Scrub grass and open fields led to a river and a tight rocky canyon. Gaining elevation quickly though the canyon, we found a high valley that led directly to an ancient moraine below Pukaraju. Nearing the mountain, the routes that we found scribbled into the Libro Rojo appeared on the face. 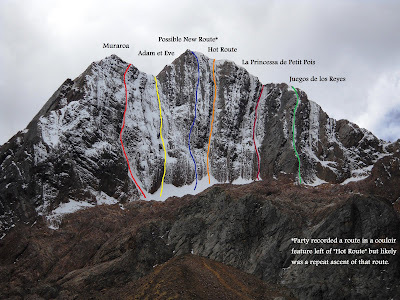 It was easy to see the major lines such as Hot Route, which took a weakness directly to the summit, or La Princessa de Petit Pois, which headed for a notch to the climbers’ right of the summit. As we deciphered these lines we became aware of some potential weaknesses that had yet to see an ascent. Though the face was holding ice, it was evident that rock would need to be climbed. Though much of the Cordillera Blanca is composed of solid granite, Pukaraju is not. We had yet to learn that lesson. Marcus’s plane took off in just 4 days. That left us enough time to attempt our route and return to Huaraz for the Fiestas Patrias festival and the Tamboraju, a local discotech that is reputably the most difficult summit in Peru! When the alarm went off at midnight we realized that the unseasonably snowy weather had hung around even late into July. It was snowing consistently. Thankfully we had a pot of fresh-ground coffee that provided all the motivation we needed and we headed out into the night. It continued snowing as we neared the face. Thankfully we were able to identify enough landmarks to locate La Princessa de Petit Pois, our intended line. On the way to the route we noticed ice pouring out of a couloir several hundred yards to the right. We lingered at its base. We knew this feature had not been completed. We also knew that we could climb La Princessa de Petit Pois. If we attempted a new route that we were unable to complete, that could very well mean that we would return home without any successful climbs. Despite this dreaded possibility, we headed for the ice and the unknown. The gods of rock-paper-scissors decided that Marcus should lead the first pitch. I have to admit that I was pretty happy following that pitch as it ended up being composed of steep thin fragile ice with sparse protection and went on forever (more than 200 ft). As I followed the first pitch I found ice that would give away beneath my feet, forcing upward progress whether I was ready or not. The steep initial ice section brought us into a long couloir feature that we would follow all the way to the ridge crest. We believed the couloir would be mostly snow and neve that we could cover quickly. It was actually composed of thin ice and mixed ground with sustained technical climbing. Even the sections that were no steeper than 60 degrees proved thought-provoking and tiring. There was very little protection. We took every opportunity to belay. Even though we stopped at the first chance to belay, no pitch was shorter than 150 ft. Swapping leads for several pitches brought us to another steep section. We had been able to see this section from the ground and believed it would be the most difficult of the climb. There was very little ice in this section and even less protection. I followed the left side of the couloir, trending right only when difficulties forced me there. The rock in this section was loose and soft. The higher I got in the feature the more I had to navigate roof features that needed to be climbed directly. I placed a small nest of protection and attempted to pull the most difficult bulge. As I hooked my picks over rock edges and worked right, I noticed that the bulge was very loose and that I was fully committed. Without falling onto a full pitch of poor protection, I knew that I couldn’t reverse what I had just climbed. The rock seemed to get looser and steeper as I ascended. I pulled on chock-stones and crack features that could have barely withstood the wind. Blocks started to fall as I dug for protection and tool placements. Our ropes suffered the brunt of at least a couple of falling blocks and got core-shot (sorry, Marcus). Eventually I worked past that feature and established a mediocre hanging belay. Because the area around the hanging belay was so steep and the belay suspect, it was easier to tie Marcus off and to continue leading on the following pitch. The next pitch was as difficult but less steep. Unfortunately there was also less protection. I continued following the left side of the couloir but was forced right by a roof feature. My protection was already several body lengths away as I hooked small rock edges and placed my front-points against the friable ice. I became increasingly aware of this precarious situation as the protection became increasingly distant. A fall was no longer acceptable. A powerful move through the roof and into a solid crack feature… and finally I completed the pitch. Along with the first pitch, the king-maker, as we dubbed these two higher pitches, proved to be the hardest section of our route. We followed the couloir for several more pitches. The climbing continued to be difficult but without the run-out nature of the earlier pitches. We reached the ridge crest in the late afternoon. As previous parties had typically descended their route of ascent, there was no well-established line of descent. After dealing with bad rock and poor protection for the entirety of our climb, we knew we didn’t want to descend our route. We found a few tattered slings on the ridge crest and decided to descend one couloir to the right of our ascent route. The poor protection continued; we accepted that we would leave any or all of the rack to get off this climb. Despite our willingness to abandon gear, the rappel stations were quite marginal. Our third rappel was off a single stopper. Then night fell. Marcus, outweighing me by 50 lbs, rappelled first. I watched as his headlamp bounced down the couloir, then disappeared. Fifteen minutes went by, then a half-hour. Was he off-rappel? No, the rope was still weighted. Was he hurt? “Marcus!” No reply. Finally after nearly an hour's wait… “off-rappel!” The station I found was not entirely awe-inspiring, but after an hour of effort it was clearly the best we could do. The ropes pulled cleanly and once again I watched as the beam of Marcus’s headlamp reflected down the couloir. I wasn’t looking forward to another chilling wait while a rappel station was established. After just a few minutes Marcus shouted up, “off rappel.” It was too quick. Had we reached a dead-end? As I rappelled into the darkness, not knowing if we were 50 ft from the ground or 500, I caught a glimmer from my headlamp. Slowly I realized that I was looking at a bolt: a single 3/8” bolt with a shiny hanger. It was the first trustworthy piece of protection I had seen that day. After all the work up to that point, we clipped a single carabiner into the bolt and rappelled into the black. The headlamp beam reverberated against the wall. It bounced five or six times, and then suddenly a solid white mass appeared. We had reached the ground. Nothing had gone as expected on this trip. The mountain that we had planned and trained for over a year’s period of time to climb was out of condition. The other prominent routes remained elusive as the year’s heavy snowfall persisted. At times even illness and political unrest barred our attempts. The unforeseen limitations and circumstances of this trip made it a true adventure. Although we had less success than we had dreamed of, 2 days later, while sitting on a deserted road beneath Pukaraju, it no longer mattered. The crowded Volkswagen bug maneuvered through the rugged pot-holed road as the light turned pink on the Cordillera Blanca. Discotechs were filled with Huaraciños celebrating Fiestas Patrias. For myself, I could only think about the summits reached and those yet to be climbed. We named our route Juegos de los Reyes (Game of Kings). I know that both Marcus and I believe alpinism is truly the game of kings. At the same time we have also come to terms with the fact that few people, perhaps even ourselves, will understand why we are driven to endure so much sacrifice just to enjoy a few fleeting moments. It is climbs like Juegos de los Reyes which justify the costs endured. I am grateful for organizations like the Mazamas and the American Alpine Club, which help climbers accomplish their dreams, even if they are merely games. Hello Nate, Thanks for the great Trip Report! I couldn't find a contact email for you in the blog. I'm interested in the ridge line linking Caraz II and Caraz III - any chance you have some good photos of it from your ascent?